It's no secret that Pennsylvania has some of the best blackjack games in the country. Don't miss reading Mark Gruetze's detailed run down on the games in virtually every casino in Pennsylvania (you won't find this information elsewhere). Wait till you read Vinny DeCarlo's true story about casinos that offered an unbelievable perk to blackjack players that ended up costing them big time. Ted Salveson, an avid scratch golfer and skilled blackjack player, wrote a report on a recent trip he took to the five MGM properties that dominate the corner of Tropicana Ave. and the Strip in Las Vegas. You'll also find blackjack reports covering casinos in California and Mesquite, NV (by KC Brooks), the Red Rock, Santa Fe, and Texas Station casinos in Las Vegas (Stu D. Hoss), and Atlantic City (Frank Scoblete). (You might also enjoy reading Scoblete's rant on card counters being "narrow-minded, arrogant, grits.") John Grochowski answers readers' questions on determining the house edge on video blackjack games, skilled-based slots, and whether coin payoffs on video poker machines are making a comeback. Eliot Jacobson analyzes the "In Between" side-bet in blackjack. The Fire Bet in craps is made by many crapshooters ... read Jerry "Stickmans" analysis of it. Last, but not least, we have a listing of upcoming blackjack tournaments, courtesy of blackjacktournaments.com. Why Purchase a Membership to BJI? How to incorporate "Grifter's Gambit" into small-team play . Test Questions and answers from the annual gathering of blackjack pros ("Blackjack Ball") . Review of the playing conditions for all the double-deck games in Las Vegas (Strip, Downtown, and Locals) . Tips on how to incorporate comps with your card counting . A summary of 15 unbelievable scams perpetrated by casino players (and employees) . Five fresh new ways to increase your profits at card counting . In addition, our team of paid reporters visited over 60 casinos and wrote detailed members-only reports on the playing conditions that they observed (and in many cases, what other non-gaming amenities that each casino offers players). This includes casinos in these cities/areas: Las Vegas, Reno, North Las Vegas, Carson City, Tunica, Biloxi, Pennsylvania, Kansas City, Minneapolis, St. Louis, I-35 corridor from Kansas to Minnesota, West Virgina, Wisconsin, and Wheeling Island. You can visit our Reports Page for a complete and updated list of the latest casino conditions. Ponder this... there are several thousand blackjack games in Las Vegas alone. Many of them are lousy games for card counters (and casual players) but some of them are excellent, profitable games. How much would you pay to know which casinos offer the best blackjack games? 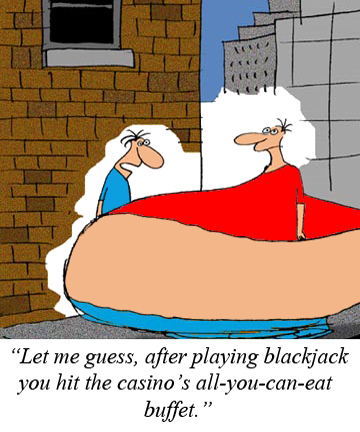 With a Blackjack Insider Membership, this valuable information will come to you each month. For example, over the past 12 months, our paid reporters scouted and reported on playing conditions in the following Las Vegas area casinos, noting which casinos offer great blackjack games (and which casinos to avoid): Orleans, Palms, Mirage, TI, Palazzo, Venetian, The Quad, Harrah's, Golden Nugget, Bellagio, Silverton, El Cortez, Hard Rock, Fiesta Henderson, Green Valley Ranch, Aliante, Binion's, California, D Las Vegas, El Cortez, M, Rampart, Suncoast, Red Rock, Stratosphere, Palace Station, Four Queens, Freemont, Gold Spike, Golden Gate, Silverton, Las Vegas Alamo, Main Street Station, Plaza, Vegas Club, and Silver Sevens. Nowadays many blackjack players also play video poker for profit. 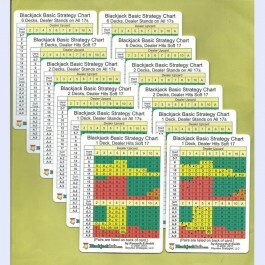 We also have that covered in the BJI with monthly articles on video poker strategies (also on craps). The cost of a BJI membership is only $19.95 per year (12 monthly issues delivered to your in box). That's only 11 cents per article/report (members and non-members articles). And when you purchase a Membership, we will send you over $50 worth of FREE products (not junk ... useful products that will help you become a better player. Click here for the list). Your BJI Membership also allows you access to over 1000 articles/reports in our archived newsletters (with a search engine that easily allows you to search for any topic. That includes the above five must-read articles highlighted above). What are you waiting for? At the cost of a few bets on the blackjack table, you'll get valuable information every month that will make you a much better, and more profitable, blackjack player. To sign up for your BJI Membership with over $50 in free gifts, click here. This excellent article, which appeared in issue #99, explains the strategies you need to gain the edge at Spanish 21. E-mail subscribers can also read each month's issue online at our web site: BJI Issue #165, Oct. 2013. "Within a year, John was the most celebrated and sought after player on the southern west coast casinos. He played at such high stakes that they all had reserved tables for him. Granted, he was up by well over a half a million dollars, but he made sure to only take a bit from each casino and to move around a lot..."
"Read Eliot Jacobson's detailed analysis on whether it's possible to beat the "In Between" side bet..."
"This trip included a survey of the five MGM properties that dominate the corner of the Strip and Tropicana Blvd. The highlight of the week occurred right away..."
"This month I ventured into three off-Strip properties in the northern and western sections of the Las Vegas Valley. Station Casinos Inc. owns all three properties - Santa Fe Station, Texas Station, and Red Rock. Here's what I found..."
"This month I report on three casinos that I visited on my whirlwind trip through California and Nevada..."
"The latest playing conditions in Atlantic City, and Frank's analysis on why card counters are often viewed as "Narrow Minded, Arrogant Gits..."
"Read Gruetze's detailed analysis of the blackjack games in nearly all the Pennsylvania casinos..."
"John Grochowski answers readers' questions on determining the house edge on video blackjack games, coin-payoffs on video poker machines, and skilled-based slot machines..."
STICKMAN'S STANCE: PLAYING THE FIRE BET AT CRAPS by Jerry "Stickman"
"The Fire Bet has been available in different venues for a few years now. Here's the analysis of this bet..."